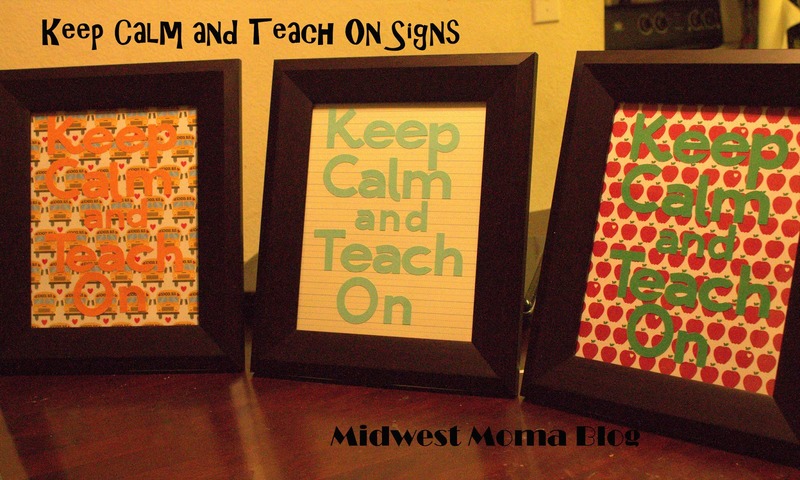 Midwest Moma Blog: Day Three Teacher Appreciation Week: Keep Calm and Teach On! Day Three Teacher Appreciation Week: Keep Calm and Teach On! I saw post after post of the "Keep Calm and Teach On" printables all over Pinterest. I however, have this tick that makes want to do my own my thing....so I put my own twist on the ever popular saying string! I broke out my Cricut Machine and used the basic font provided for free with the Cricut Craftroom software and cut out the letters I needed to make the sign. "Keep Calm" and "Teach On" were cut at the 1.75 inch default height and the "and" was cut at the 1.25 inch default. I found the cutest teacher themed scrap book paper to back these phrases and did a different one for each of my teachers! I really hope they love them as much as I do!